Carrot CEO David S. Utley Talks New $25M Round and How to Get People to Stop Smoking | Carrot, Inc.
Pivot uses mobile technology, behavioral science, and clinical expertise to help people quit. It really goes without saying at this point that smoking is bad for you. That’s something the majority of us have been hearing that our whole lives. Yet, according to the Center for Disease Control, tobacco use still causes nearly 6 million deaths per year around the world, more than 480,000 of which occur in the United States. That is 1,300 deaths every day due to smoking. The fact that those numbers are still so high is proof that, so far, the efforts to curb smoking still have a long way to go. It’s obviously going to take more than just telling people how bad it is for you. Digital health company Carrot has a different approach; its platform, called Pivot, takes a multifaceted approach to getting people to quit smoking, involving mobile technology, behavioral science, and clinical expertise. On Monday, the company announced that it raised a $25 million round of funding led by JJDC, along with New York Life Ventures and existing investors Khosla Ventures, Marc Benioff, Carrot founder David S. Utley, M.D., and R7 Partners. This round brings the company’s total funding to $45 million. I spoke to Utley about the new round, his company’s approach to getting people to quit smoking and how advances in healthcare have made a solution like Pivot possible. VatorNews: Obviously smoking and the health risks associated with it are a major problem that people have been trying to solve for a long time. Walk me through how your solution works, and why you believe it will be able to finally be the answer. David Utley: The answer, at least in part, has been out there for a long time. Research has proven what methods have the highest quit rates. The problem has been that those evidence-based methods have been delivered in ways that couldn’t scale and that were very un-engaging, like telephonic coaching, in-person counseling. Pivot incorporates those same evidence-based methods. But we started with two main questions: What is something that smokers would actually want to use, and how could that be scaled to reach millions of them? 70 percent of people who smoke say want to quit. It’s not a matter of convincing them that smoking is unhealthy; it’s a matter of creating something they’ll actually be excited to use. So, we created our carbon monoxide breath sensor—we give our users a neat piece of mobile technology that is both novel and informative. It gives them a completely different way to view and think about their smoking. Then, we developed a smartphone app that begins with the user—one that is engaging in and of itself. We’re not using an app to deliver evidence-based quit methods to users; we’re using an app to pull users into an evidence-based environment that meets them where they are and gives them the tools and support they need to quit smoking. That’s a really important distinction. VN: Who is the competition? How does your solution differ from others on the market? What are you doing that they are not? DU: We have an FDA-cleared medical device, our sensor, that enables users for the first time to visualize their smoking trends and smoke exposure. This is Bluetooth enabled and available over-the-counter. No one else has anything like that. And we’ve built our program to incorporate a model of behavioral science called self-determination theory, where we give the user information to help them develop intrinsic motivation to quit. We built the program for smokers at any stage in readiness to quit, and our goal is to help them all get to the point of a smoke-free life. No one else is taking this approach in this space. So, proprietary, FDA-cleared technology and a unique behavioral model. We’re clearly differentiated. There are other new app-based services out there. But no one is coming at this problem as holistically as we are. VN: Who is the typical customer for Pivot? DU: Our initial market is self-insured employers and health plans, to offer Pivot to their employees/members who smoke. We have to have a great B2B story, health benefits and economics, as well as a great B2C story, where users will adopt and use the product. DU: We’ve gone live with seven corporate partners to date. Our focus of this round is to grow the commercial team and scale the offering to reach 50 clients this year. VN: What kind of ROI have you been able to calculate for people who use Pivot? How quickly are you able to get people to quit smoking and at what rate do they lapse back? How does that compare to other solutions? DU: In our clinical study 34 percent of participants achieved 30 days of continuous abstinence, and 27 percent reported continued quit at the end of the program, which is three months. With a 25 to 35 percent quit rate, we estimate that the ROI of Pivot for an employer is 4 to 5x in the first two years based on health care and productivity savings. VN: What will you do with the new funding? Will it go toward hiring, product development? DU: This round will go primarily toward scaling our commercialization efforts. We plan to expand our executive and sales teams and invest heavily in marketing and sales support. And we will never stop iterating and improving the product. We will continue to refine Pivot, explore new solutions for different market segments, and continue doing whatever we can to help more people quit smoking. VN: How has the way healthcare has evolved in recent years allowed a solution like Pivot to thrive? What factors do you see helping to continue to help Pivot going forward? DU: The move toward digital therapeutics has been a huge opportunity for programs like Pivot, where interacting with apps on your phone or web based apps has become a more standard way to deliver important health information and digital health programs. In addition, the advent of sensors and people’s growing interest and comfort tracking their health through personal sensors. We see all of these trends continuing to grow, which will help our ability to reach more people in coming years. VN: What is your ultimate goal with Pivot? What would success look like to you? DU: Our company mission is written right on the front wall when you walk into our office: “…to engage and empower millions of people to quit smoking.” That’s success for us. Saving millions of lives is our ultimate measure of success. REDWOOD CITY, Calif., March 8, 2018 — Digital health company Carrot Inc.
REDWOOD CITY, Calif., March 20, 2018 — Digital health company Carrot Inc. today announced that it has signed a partnership agreement with RedBrick Health, a Minneapolis-based health technology and services company. 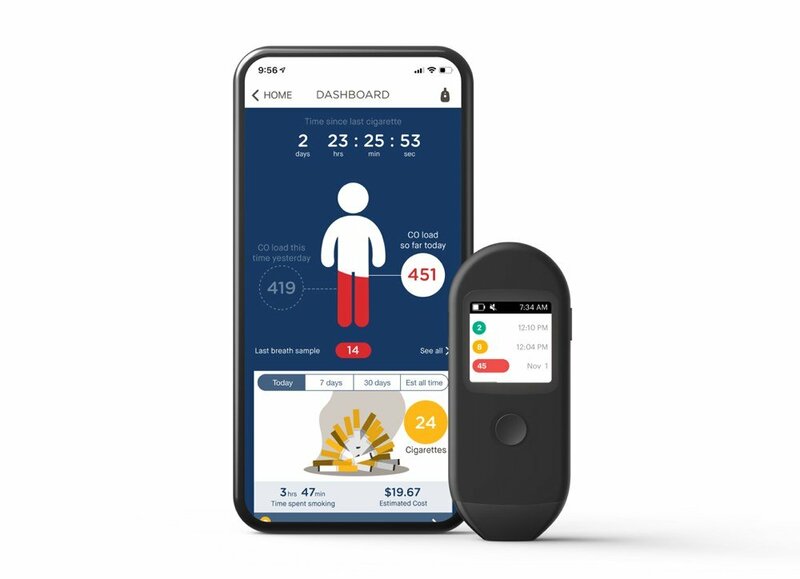 Johnson & Johnson Innovation – JJDC, Inc. (JJDC) leads the investment, joined by New York Life Ventures, Khosla Ventures, Marc Benioff, and R7 Partners REDWOOD CITY, Calif., Oct. 29, 2018 /PRNewswire/ — Digital health company Carrot Inc. Carrot Inc.’s Bluetooth-enabled mobile device helps users learn how smoking affects their carbon monoxide levels REDWOOD CITY, Calif., October 3, 2017 — Carrot Inc. announced today that its Carbon Monoxide Breath Sensor System has been cleared by the U.S.
Our first product, Pivot, marks a major rethinking of why and how people can quit smoking.